← Let’s discuss: Tack on the Trailer? Green horses are so rewarding in some ways. Especially when you have a quick study, like Riley (who by the way has also mastered smiling and targeting a tennis ball beyond his under saddle work). Every day I can feel a bit more progress, a little more stamina. We’ve only got a few jumping sessions under our belt since the priority has been building a baseline fitness (myself included), but now that that’s established the work can get a little more fun and varied. 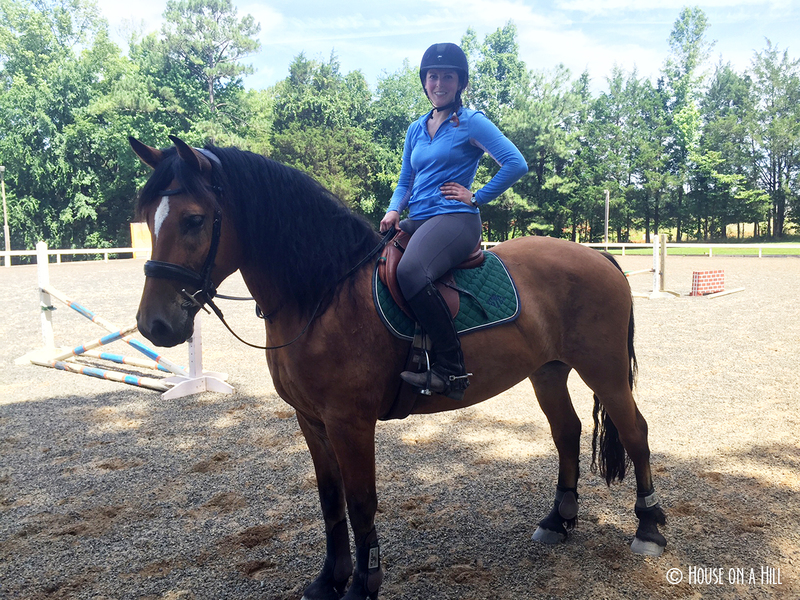 So I set up a basic course yesterday, between 2′ and 2’6″ with long approaches and inviting ascending oxers. We kept things short and sweet, so that we were done over these (slightly) bigger fences before anyone got super tired. I’m still working on my two point, which somehow didn’t make it into the video, and working on trying to keep my hands still on the approach. Getting my hands tangled in Riley’s giant mane makes quiet hands a little easier, albeit it has a negative effect on steering. I see plenty to be improved for both of us (especially myself), but it’s exciting that we are coming along so quickly. Getting excited for the faux-show this weekend! He is so cute. Glad you’re having fun on him! You guys are both looking so much more balanced and confident! Plus, holy cow. What a freaking adorable face on Riley!! How do you even?! Oh my gosh- I’ve got to get a video of him mugging for kisses. He is seriously just the cutest. It’s so neat that you have Riley to have fun with, I saw your jumping video on Instagram and loved it. Really smitten by this cute and cuddly guy!! You’ve also done great with him because he’s looking a lot more athletic now! Omg I’m even more in love with him now!!!! !